The Echoes from the Drift Kickstarter campaign is currently underway! 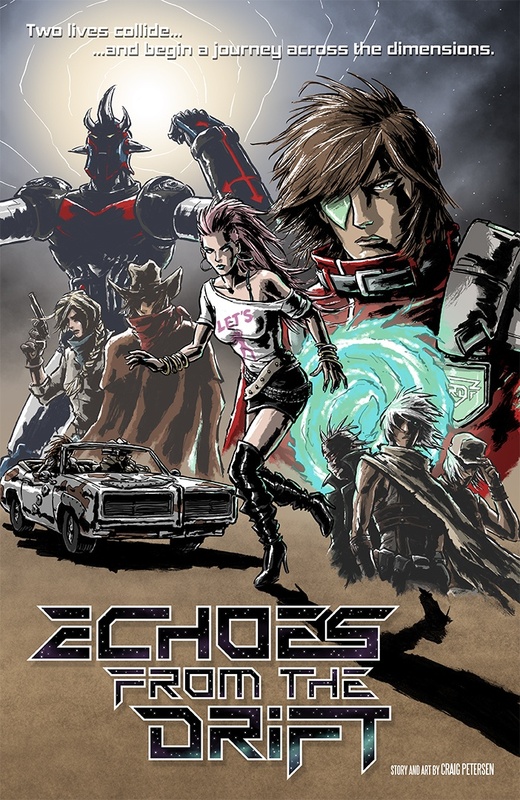 The goal of the campaign is to create a 22-page issue of Echoes #1 (part one of a five part story). Now that a certain number of Backers has been reached, the digital comic will be enhanced with bonus content and a print version will be created for most Backers! Besides the comic, unique sketches and the original artwork from Echoes #1 are also available as Rewards! For anyone thinking of making their own crowdfunding video (or any other indie video project, for that matter), you can add music to your video from the “Free Music Archive”. However, just because the music on the site is “free”, doesn’t mean you can use the tracks for everything. Be careful to check the licence that each track has. Some have a Non-Commercial licence, and since crowdfunding is about trying to make money for your project, those tracks can’t be used in your video. However, I’ve read that if you contact the composer, there is a possibility they’ll let you use a Non-Commercial track for commercial purposes. Unfortunately, you can’t browse the site by licences, which would be an awesome extra search filter for them to have. 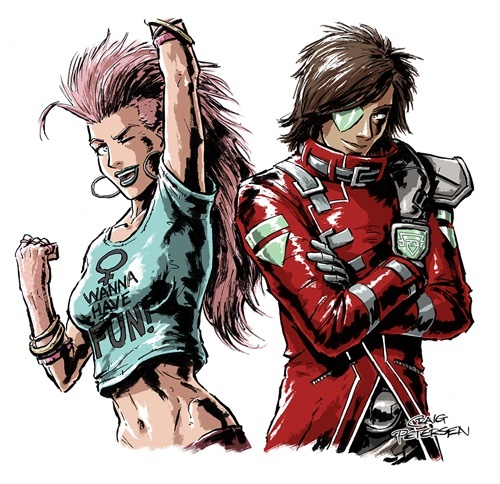 But, if you take the time, you can find some interesting tunes, in many genres, by artists who don’t mind you downloading or remixing their tunes, which is pretty cool. You can even donate to them if you really like their tracks. As you can see it has a Creative Commons Attribution License, so as long as you credit the composer and state that you got the track from the Free Music Archive, you’re good! So, a quick update. Preparation for the “Echoes from the Drift” Kickstarter campaign is shaping up well, with a few final decisions to be made before I announce it properly. There are a lot of things to be considered and I want to put it together the best that I can before telling you all about it. The 2nd draft of issue 1’s page layouts is progressing well. It’s really nice to get some drawing done amongst all the number crunching! What do you think? Are you excited about “Echoes”? Are you curious about the new characters? Let me know! Here is some general information that I’ve found out as I’ve been planning my crowdfunding campaign for “Echoes from the Drift”. I hope it’s a good place for you to get some general knowledge about crowdfunding and there are links at the bottom of this post, if you’d like to know more. Why do people use Crowdfunding? Crowdfunding is a great way to help individuals (or small teams) make their project a reality. People around the world can contribute money to a project and end up with some great new products that would be very expensive for a creator to fund by themselves. Creators can talk to their audience through the crowdfunding websites and let them know, step-by-step, how the project is progressing. In return, people can become involved with the project by asking questions or sending comments to the creators. Plus, you can end up with some exclusive bonus items that won’t be available anywhere else. There are several types of crowdfunding strategies. The most common is being able to, essentially, pre-order a product. But other examples include donations to charities, donating monthly payments to help support creators, or investing in a new enterprise. Crowdfunding websites (such as Kickstarter, Indiegogo, Patreon and several others) act as a hub where creators tell you about their projects and you can decide if you’d like to support them (or in Kickstarter terms, become a “Backer”). A backer becomes a patron or sponsor for that project and, at the same time, makes a pre-order of an item (or items) from the project. Projects can range from the creation of new comic books, boardgames, video games, films, music, inventions, dance events, charity causes, the list goes on. The example I’ll be talking about here deals with the pre-order of a product. There are various “Rewards” (also known as “Perks” at Indiegogo) that the creator will offer to you (e.g. a digital comic; a digital and printed comic; a printed comic with a sketch; etc.). On the page of the creator’s campaign, you can select the reward that best suits your budget for what you would like to receive. The creator states his/her financial goal on their campaign page and people will have a set time limit (usually around one month) to support them and help them reach that goal. If the creator succeeds in reaching that goal amount, you will be charged the amount that you said you would pay for the reward you asked for. If the creator does not reach that goal, on sites such as Kickstarter, no-one will be charged and the campaign will be unsuccessful. When you want to support a creator’s campaign, you will need log in to the site of their campaign, enter your credit or debit card details (most cards are accepted, but check on the site) and select your reward. You won’t be charged for the reward until end date of the campaign. On Kickstarter, you’ll only be charged when the campaign’s financial goal has been achieved. Some projects on Indiegogo will charge you for the amount you agreed to donate, even if the goal hasn’t been achieved. What if I like a project, but can’t afford much at the moment? Most crowdfunding sites also offer you the chance to just donate money towards a campaign without asking for a reward. You also can offer support to the campaign in other ways, by telling your friends and family about a campaign you like, to help that creator get more supporters. Some campaigns offer “Stretch Goals”, where if a certain amount of the goal is met during the campaign, the creator will offer additional rewards (e.g. a different cover for their comic, or a new set of miniatures for their game, etc.). When will I receive the goods I ordered? The project will have an estimated delivery date on when you will receive your rewards (usually this is written below the reward). The creators will keep in touch with you via the campaign site and emails to give you updates on their progress, during and after the campaign. You can also post comments on the campaign page to find out progress or cheer them on. Sometimes, crowdfunding campaigns fail. The creators have only a short time to reach the goal, so sometimes they will need to rework his/her campaign and try to raise funds again later. Even if the campaign is successful, sometimes creators can’t meet the deadlines they’ve set for themselves. Or unexpected complications arise and they just can’t complete the project for you. Unfortunately, there have been cases where people have used crowdfunding to swindle money from others. These disreputable individuals say they are going to create products for you, take your money and you never hear from them again (or they start another project without completing the one you backed). These “scampaigns” get reported by backers to the crowdfunding sites, but there is usually little hope of getting your money back. So, be safe and check through the information on the creator’s campaign page carefully. Are there ways I can more confident about backing a project? In crowdfunding campaigns, the backers trust that the creator will do their best to deliver, but there are no guarantees (it’s not like buying an item from an online store). Also, there can be long time delays before you receive your product. So you need to consider how much work they’ve put into their campaign, their skill set, and how reasonable they are with what they offer and the time frame they’ve set for the delivery before you decide to back their project. The more information you get from the creator (seeing them in the campaign’s video, getting links to their Facebook pages and websites), the more faith you can have in them. It’s an honesty and trust system. The creator’s personal and professional reputation is on the line. Creators want to succeed and not let their backers down but sometimes, for various reasons, delays happen. That’s why it’s important for creators to update their backers on the status of the campaign and announce any possible delays to maintain the trust and keep the backers informed. Did you like “In Ruins”? Want to know what happens next? Then find out in the first issue of my new comic book series, “Echoes from the Drift”! In “Echoes from the Drift”, the story centres on the exploration of parallel worlds and introduces two new characters – Jenni and Zayf. But, don’t worry, along with the new faces, there will be plenty of familiar ones for “In Ruins” fans. “Echoes” is a story I’ve been wanting to tell for a long time. I’m including a lot of influences from my favourite shows from the late ’70s and ’80s, including “Mad Mad”, “Fist of the North Star”, “Star Wars”, “Battlestar Galactica”, “Mazinger Z”, “UFO Robo Grendizer”, so-called “Spaghetti Westerns”, “Blade Runner” and “The Fifth Element”. Like I did with “In Ruins”, I’ll be putting my own twist on these shows to make the story fun, dramatic and personal. Finding a publisher can be a complex process these days. There’s a lot of really good artists out there. The waiting times can be long until you hear back from publishers (from a few weeks to a few months). Also, it seems to be preferable if you’ve been published before and have an existing fanbase to get their attention. So, I’m planning to crowdfund “Echoes from the Drift”. This way I can tell the story in the way that I’d like to and get support from people who like the idea and can help turn this dream into a reality. Using crowdfunding means that fans and supporters can have sneak peeks of the art while the comic is being created. Supporters of “Echoes” will also have the opportunity to obtain exclusive extras, such as original artwork, which can be difficult to obtain unless you go to a lot of international conventions. This way, everything is in one place. I’ll be writing, pencilling, inking and colouring the new series, as I did with “In Ruins”. It’s a lot of work, but I think the result will be worth it. I’m planning an initial 5 issue story arc. The overall plot is done and a lot of groundwork has been completed for the first issue already, so I’m putting the finishing touches on my crowdfunding campaign and will let you know when it’s ready to go! For those of you who don’t know much about crowdfunding, I’ll be creating a post that goes over the basics. To give you a little taste of “Echoes from the Drift”, here’s one of the first pieces of art I created for the series. This pic would have been made somewhere in the late ’90s or early 2000s. I was trying to mimic the colouring technique that Tetsuya Nomura used for the character designs in the “Final Fantasy VII” video game. 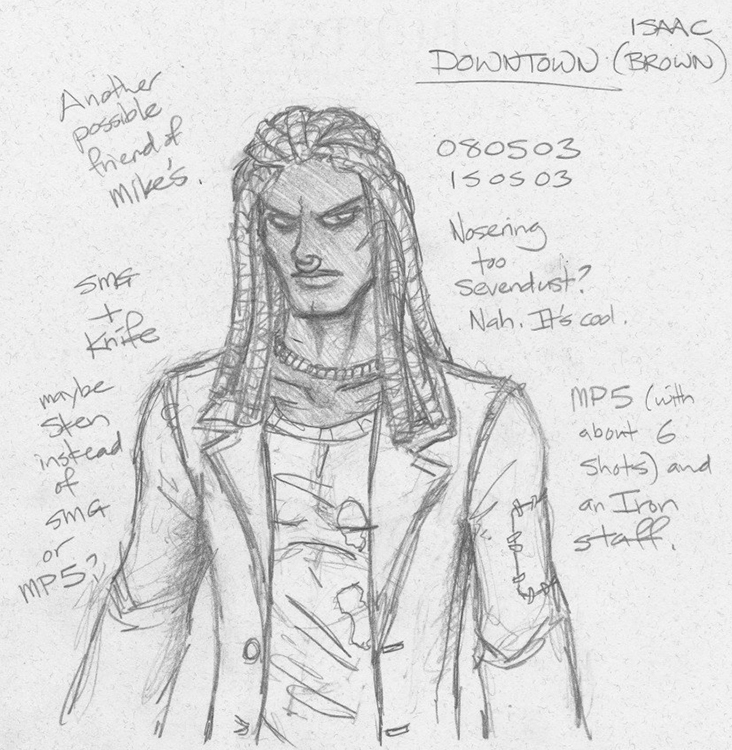 This version of Isaac is pretty close to the “In Ruins” version of Downtown. I’m glad I stuck with the Wild West theme. I think it suits his character. 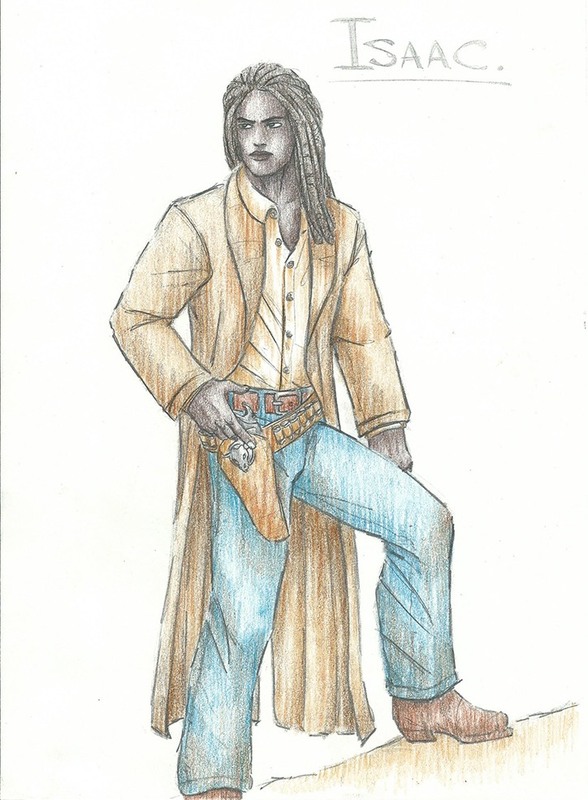 Originally known as Isaac, he was a character designed for the Weird West RPG “Deadlands”. However, I only played that game once and he never got the chance to actually get used. I always liked his design though, so when I was thinking about including him in one of my series, I came up with his surname and his urban nickname. Downtown’s looks were based on a combination of a couple of guys – Gary Dourdan’s character Christie from “Alien Resurrection” and Lajon Witherspoon from the band Sevendust. He’s also a bit of a mix of some of my friends, so I knew that Downtown would be great to include as Jake’s amigo. Downtown’s clothes have remained in a Western-style for “In Ruins”. I thought it’d be interesting if he took the clothes from a predominantly White hero culture (at least in a Hollywood movie sense, in reality there were actually quite a lot of Black cowboys) and made them his own. Downtown is the owner of the Pontiac he and Jake travel in (it’s his version of Silver, the Lone Ranger’s horse). I thought that instead of a lone survivor trudging across the wasteland, it would be cool to make the “In Ruins” comic more like a buddy film. It allows the guys room to express thoughts and argue, but when the chips are down, they pull together. I think it’s worked out well in the comic and creates something different from the “Mad Max” films it’s obviously based on. Unfortunately, I don’t have Isaac’s original character sheet with me in Europe (it’s somewhere in my gaming stuff in New Zealand). But, I do have another pic of Downtown from 2003 (Jake was still known as Mike in those days). There you go! A little backstory on the design of Downtown. Here’s the original Aftermath RPG character sheet of Mike Sterling (now known as Jake McKenzie from “In Ruins”). The top and bottom right drawings would have been done sometime around 1986 (when I was a young teenager). Back then, I gave Mike the backstory that he had looted a museum, which was why he ended up with such an eclectic collection of weapons. I mean, look at him, nunchaku, a crossbow and bolts, WWII Colt.45 (it says so on the holster! ), boot knife and a Sten gun. Topped off with a suit of chainmail under all those clothes, a G.I. Joe American Army helmet and a hockey mask to try to minimise the amount of damage he could take in that brutal RPG. The hockey mask is a nod towards Casey Jones from the “Teenage Mutant Ninja Turtles” comics and Jason Voorhees from the “Friday the 13th” films. Mike ended up with a robotic arm in-game and I modelled it on Hamerstein’s arm from “Ro-Busters” and “ABC Warriors”, which appeared in the Starlord and 2000 AD comics. 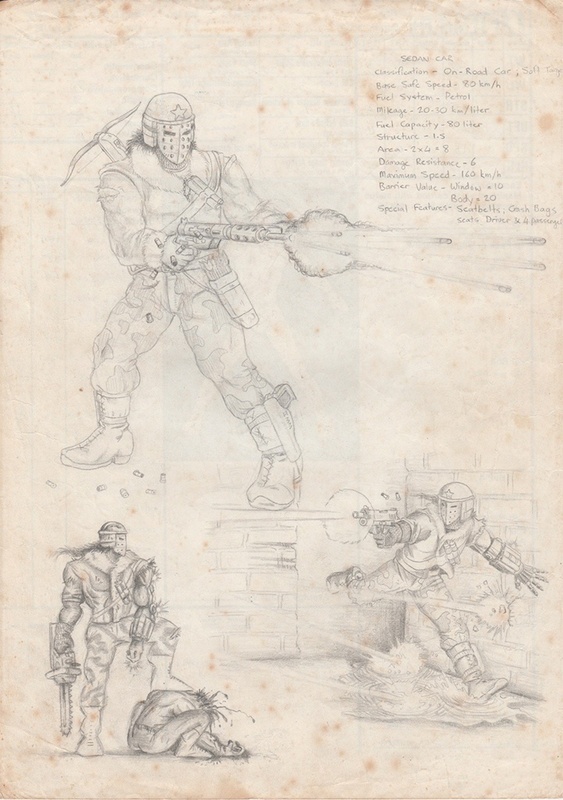 In the bottom left of the page, Simon Bisley’s work on the “ABC Warriors” in 1987 was obviously an influence on my art. I added yet another weapon to Mike’s arsenal which is his now signature chainsaw. Here it is! The conclusion to “In Ruins”! Thanks to everyone who has been reading and commenting. Stay tuned for more news on where the story goes from here! Now, go and have fun reading Page 10!